Preheat the oven to 350°F (176°C). Line the bottom of a 9-inch (23-cm) springform pan with parchment paper and grease the sides. Note: if your springform pan leaks, use a 9-inch (23-cm) cake pan so the brownie batter won’t leak out while baking. To make the brownie, combine the melted butter, sugar and vanilla extract in a medium bowl. Add the eggs and mix until well combined. In a separate medium bowl, combine the flour, cocoa powder, baking powder, and salt. Slowly add the flour mixture to the egg mixture and mix until well combined. Pour the batter into the prepared pan and spread it out evenly. Bake the brownie for 22 to 26 minutes, or until a toothpick comes out with a few moist crumbs. Remove the brownie from the oven and allow it to cool for 3 to 4 minutes, then remove it from the pan and transfer it to a cooling rack to finish cooling. 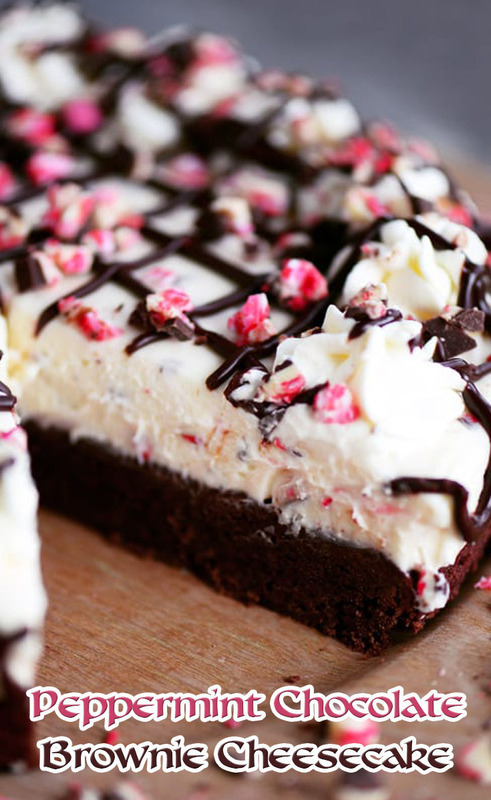 Once the brownie is cool, make the cheesecake filling. In a large mixer bowl, beat the cream cheese and sugar until well combined and smooth. Add the peppermint extract (2 tbsp for a strong peppermint flavor or use light for a lighter flavor) and vanilla extract. Mix until well combined and smooth. Set this mixture aside. In a separate mixing bowl fitted with the whisk attachment, whip the heavy whipping cream and powdered sugar until stiff peaks form. Gently fold one-third of the whipped cream into the cream cheese mixture until combined. Gently fold in the remaining whipped cream until well combined. Gently fold in the peppermint swirl bark (or candy canes) until evenly distributed. Place the brownie back into the 9-inch (23-cm) springform pan. Line the sides with parchment paper that sticks out about 1 inch (3 cm) above the sides of the pan to act as a collar and account for possible overflow. (Note: if you used a regular cake pan for the brownie, it may be a little different size. You can use the same cake pan for the following steps but you’ll want to put a piece of clear plastic wrap in the pan first, followed by a cardboard cake round that the brownie will sit on. You’ll use the clear plastic wrap to lift the cheesecake out of the pan when it’s done.) Spread the cheesecake mixture evenly over the brownie. Refrigerate the cheesecake until firm, about 5 to 6 hours. Once it is firm, remove from the springform pan (or cake pan) and set it on a serving plate. To make the whipped cream, whip the heavy whipping cream and powdered sugar until stiff peaks form. Using the whipped cream, pipe a swirl border around the edge of the cheesecake. Drizzle the chocolate sauce over the cheesecake. Refrigerate the cheesecake until you are ready to serve. This cheesecake is best eaten within 2 to 3 days but should be fine for 4 to 5 days.